Model T Ford Forum: Railroad Shop rules from the past. 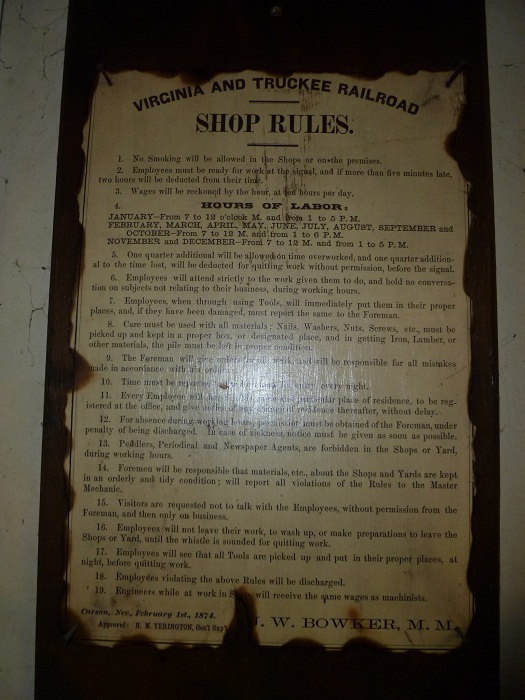 Railroad Shop rules from the past. Model T Ford Forum: Forum 2011: Railroad Shop rules from the past. Hope you can read this. 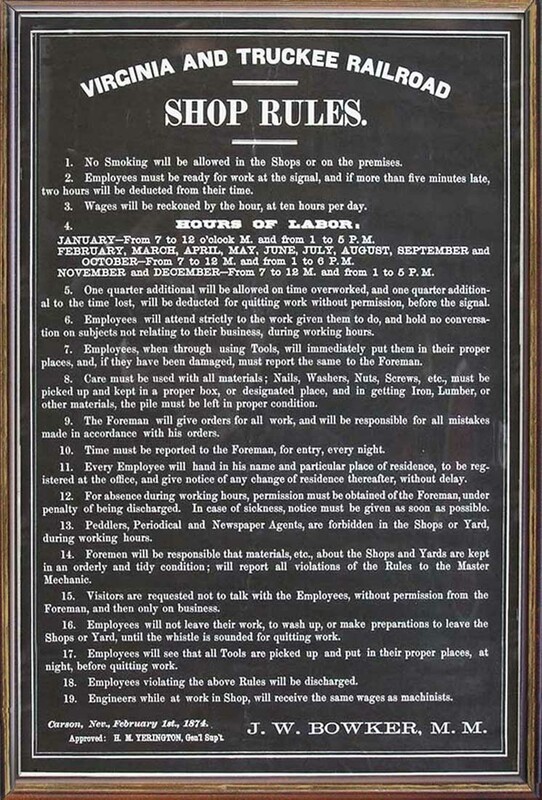 I wounder what would happen if you posted these rules in an office or shop where you can play computer games at work ???? Can someone with computer skills enlarge this so it can be read, please. I believe that Ford may have had rules somewhat like this for there plants. Interesting. Dated Feb. 1, 1874. 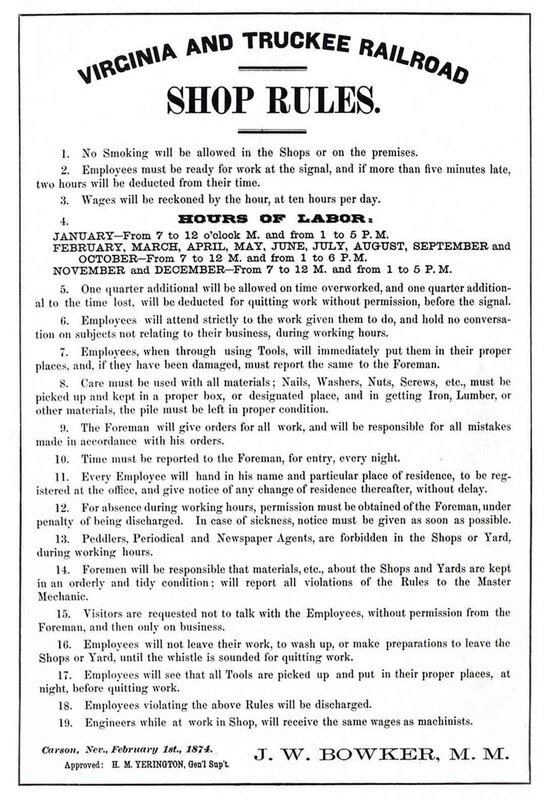 I'd like to see a list of Ford's factory floor rules for Model T line workers. Here is a bigger copy. Can't do much with the bright spot in the middle. Here's a larger version I found on a Google Search....You may have to click on the photo to enlarge it to full size. I would guess that actual practice varied from some of the official rules. 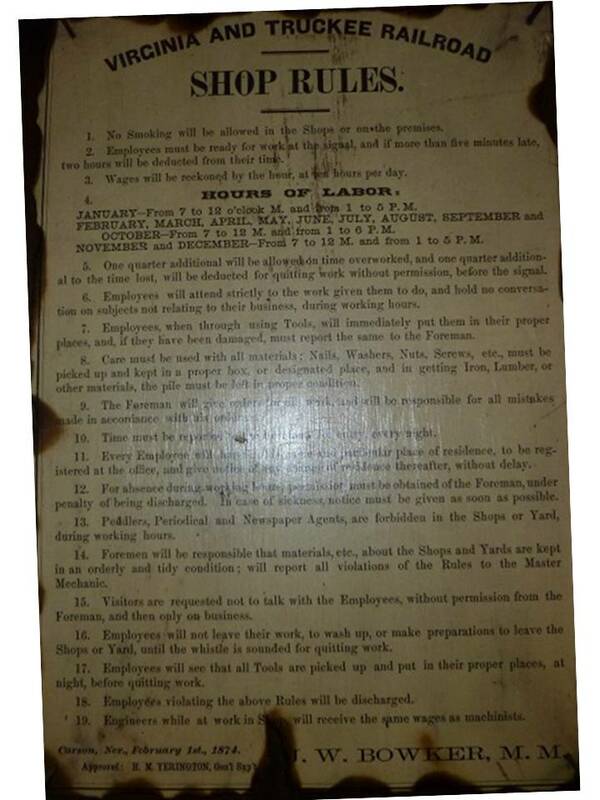 A longstanding negotiating tactic in labor disputes has been for workers to threaten to actually follow all the rules laid down by management. I think most of us would fail rules 7 and 17, I know I would "some of the time." I would like to see Fords rules also, I bet there close. John William Bowker was Master Mechanic in the 1870's on the Virginia and Truckee. 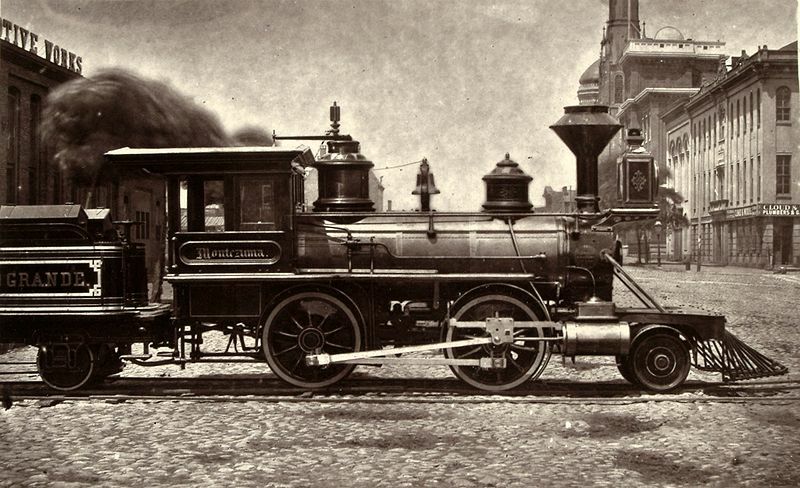 The railroad ordered a locomotive from Baldwin, a 2-4-0, and was delivered in February 1875 as the JW Bowker. Legend has it that having a locomotive named for him went to his head and he was discharged. The locomotive was renamed "Mexico" in 1876. It was used in "Union Pacific" by Cecil B. DeMille in 1939. At some point from 1876 to 1939 it was restored as the JW Bowker because it sported that name at the 1939 World's Fair. 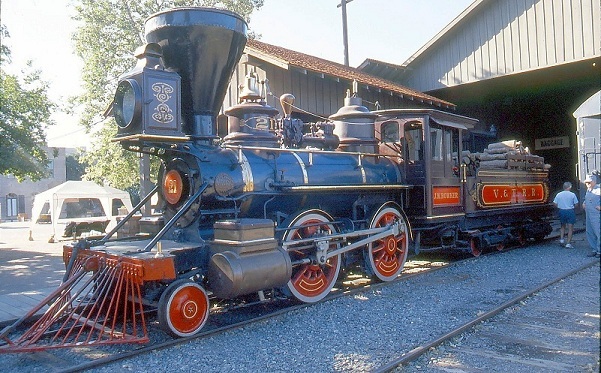 It is the only surviving example of a 2-4-0 built by Baldwin in The US. While I didn't find the Bowker I did find this factory photo. side of there yards in Carson City from about 1890 to 1910, then he moved to Susanville Ca. His brother was an engeneer for them, I have his RR watch. Do you know when they changed from wood to oil fired ?? I believed that was the reason he moved. For those who may want to print it and have lots of black ink, here is a touched up version of the white on black framed �Rules�. All of them were converted to burn oil by 1910. They actually went from wood burning to coal burning almost immediately after being purchased. The Reno, V&T # 11 was built in 1872 and converted to coal in 1876 and to oil in 1907. The Inyo, which was V&T engine number 22, was the second to last locomotive to be converted by the V&T to oil and that was in 1910. As you may know, most of the V&T engines are movie stars, the Inyo having been in numerous westerns and at least one Disney movie. The Reno is the oldest surviving V&T engine and resides at Old Tucson Studios. It does not run on steam but has had it's boiler gutted and fitted with a diesel powered air compressor which makes the engine move. This is the JW Bowker. As you can see, except for the name in the above picture, it's the same type engine. Anyone know what the locomotive was that was used in the "Casey Jones" TV series in the mid'50s? Or am I the only one that remembers it? Or that Alan Hale Jr was the star of a TV series before "Gilligan's Island"? Wayne, I'm about your age and all I remember was the theme song but never remembered any of the actual episodes. I've recently watched a few shows but it's pretty hard to take the show seriously. It's fun to reminisce but pretty corny even for a show of that era. Gilligan's Island was probably more believable. Just my opinion, see what you think. Wayne, that would be the Sierra Railroad #3, based in Jamestown, CA. Also used for opening credits of Petticoat Junction, scenes in Little House on the Prairie, Bonanza, and probably most famously Back to the Future Part 3. Wayne, the engine that was used in the C.Jones series is the same engine that appeared in Petticoat Junction it's a 2-6-0 that was converted to look older. Built in the early 1900's I believe. It's actually close to you. Part of the Sierra RR ? It's waiting to be rebuilt. I remember because both engines on TV had Elk antlers mounted above the headlight. Found it !!! Sierra #3. Probably the most filmed live loco used in Hollywood. In the early 1950's our grade school library had a book about a young boy running an engine similar to the Baldwin 2-4-0. He was alone and at one point fell off before entering a horseshoe curve but got back on at the other end of the curve. Do any of you "old" railroad fans remember reading this? I can't remember the title and every time I see a photo of one of these engines I am reminded of this book. That book might be "The Circus Train" published by Whitman in 1958. It was a book of verses by Jessie Knittle. There was a drawing of a 2-4-0 in the book. Thanx. 1958 is too new for this book and it wasn't in verse. Dale, I can't identify your book, but I can tell about another from the same era. In grade school, about 1952, I loved Engine Whistles. It was the second in a series. The first book, Singing Wheels, tells of pioneers on the frontier in the early nineteenth century and describes their daily lives. Engine Whistles begins with the main Character, a boy named Tom, riding the cab of a Locomotive crossing the prairie in 1879. Again, the book tells of people's daily lives, and in the margins are little drawings of tools, clothes, furniture, and other familiar items of daily life. The book ends with Tom's son, also Tom, in 1910, experiencing automobiles, airplanes, and movies. In the postlogue, another young Tom is traveling by air in the 1940's. After Gene, Roy, the Lone Ranger, and others had filled my head with cowboys and pioneers, I ate up books like this. Thanks for the Serra Railroad info. and for Railroad buffs, look up the book Traines to Yosemite by Jack Burgess ( friend and Historian of the Y.V. RR) and a film "color of a Brisk and leaping Day" ( Black & white) that was in the Sundance Film Festival a few years back. It has great old film footage of the YV railroad in operation 1900 to 1945? and the Model T rail car from Jamestown in it. Happy New Year the WORLD over. Thanx,Steve. I'll look for them.